Navigate Your Stairs Outside Safely and Smoothy with a Senior Safe Ramp. 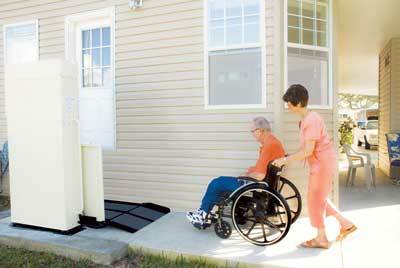 At SeniorSafe of Ohio we have the ramp and lift solutions to meet your unique needs. Our aluminum modular ramps are virtually maintenance free and provide the safest surface available in the industry. The metal mesh design prevents water from sitting on the surface, providing much better traction than traditional ramps. It is the only ramp to consider for outdoor use during our Ohio winters. And besides the standard silver color, they are available in green or black powder coat finishes. 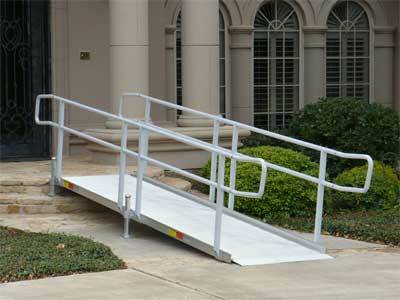 We also offer portable ramp solutions for assisting in loading scooters and chairs into vehicles. We have numerous sizes and surfaces available. 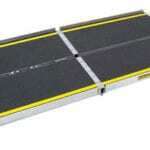 If it’s a small rubber or metal threshold ramp you are searching for, we can help with that as well! Whether you are searching for temporary handicap ramps or more permanent ramps for the disabled, handicap ramps specifications are the most essential features to examine. The standards for wheelchair ramps for the disabled are legally established by the Americans with Disabilities Act (ADA). 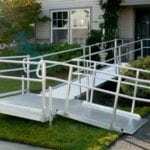 Safety engineering standards for handicap wheelchair ramps for the disabled govern acceptable ramp width, minimum weight bearing strength, required platform dimensions, handrail height and maximum slope or gradient. How to build a wheelchair ramp is a process which requires medical information from your physical therapist and rehabilitation physician. 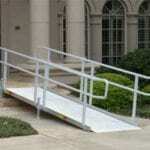 Pictures of wheelchair ramps will help you finalize your handicap ramps for the disabled plans. Contact one of our associates today to discuss your special needs and limitations and begin your customized ramps for the disabled design plan today.